Russian restaurant Mari Vanna is a welcome, quaint and quirky addition to Dupont Circle. It’s hard to believe that the brick country-kitschy interior that was the background to a lazy Sunday dinner also serves as a hot nightlife spot. Especially since it has little in common with its cousin up the street, Russia House, except for the leggy hostesses and flavored vodka of course. It is something special to see an innovative Russian restaurant come to town. On the bottom of their menu, you’ll find a notice that you can receive a free vodka shot by checking in on Facebook. On Monday evenings, they appear to turn into some kind of Slavic speakeasy. The Best Thing on the Menu: Siberian Pelmeni (пельме́ни) are small dumplings filled with mixed meat and made of unleavened dough. 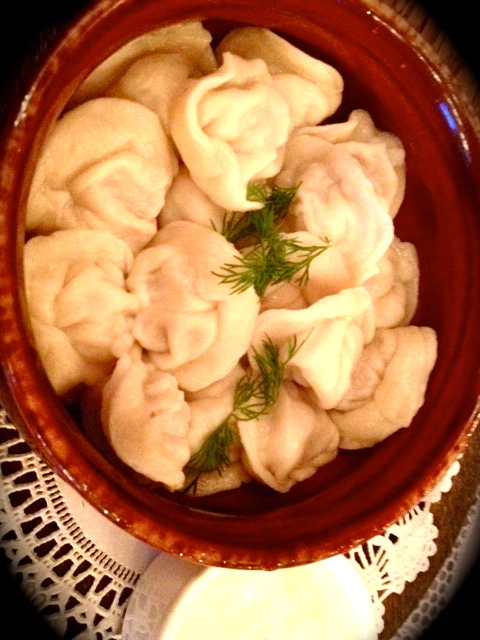 They are close dumpling friends with Ukrainian vareniki, also offered at Mari Vanna, and the Polish pierogi. The pelmeni, though vaguely resembling Chef Boyardee ravioli at first, are gamey, salty and delicious. They are served with sour cream (as are all dishes at Mari Vanna) and come in a small kettle. According to the School of Russian and Asian Studies, store-bought pelmeni are considered fast food in Russia and are associated with students’ or bachelors’ lifestyles, much like instant ramen. Speaking of college cuisine, beer drinkers headed to Mari Vanna should note that although not on the menu, beer is available. A Russian insider explained that you order Russian beer by the number. The higher the number, the darker the beer. So, don’t be surprised when your server says they have 4, 8 and 9. Siberian Pelmeni not your BTM? Post your favorites in the comments section. This entry was posted in Restaurants and tagged Best Thing on the Menu, BTM, Mari Vanna, Pelmeni, Russian, Vareniki. Bookmark the permalink.